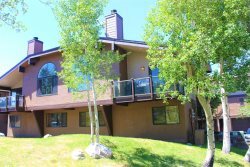 Two bedroom cottage in the heart of June Lake. Close to fishing, skiing, shops and resturants. Spacious main house at Lakefront Cabins. Walk to everything! Sleeps up to six. Lakefront Cabin's Main House Cottage can accommodate up to six people. The first bedroom has a queen bed with a closet and small dresser for your belongings. In the corner is a vanity area for getting ready. The bathroom, adjacent to the bedroom, has a standing shower, toilet and sink. The second room has two twin beds, with benches at the foot. There is a closet for belongings with coat hangers provided. The living area has a full futon in a lovely wooden frame. Relax and enjoy a DVD or cable on the wall mounted 32" TV. There is a fully equipped kitchenette. Enjoy meals at the dinning table for six or step outside to the court yard and enjoy your meals at the picnic tables. The courtyard also offers shared barbeques, extra outdoor seating and a fish cleaning station. Free WiFi included too! Lakefront Cabins are located close to the shores of June Lake and is walking distance to alomst everything including the village resturants, June Lake Brewing, June Lake Campgrounds, June Lake Marina and Gull Lake Park. World class trout fishing is just 500 feet from your front door. There is no maid service. Cleaning is done prior to arrival. NO PETS ALLOWED! Please call 760-648-1919 the day of traveling to make arrangements if you will be arriving after 5 pm.